St Joseph's, Broadstairs fly the flag! 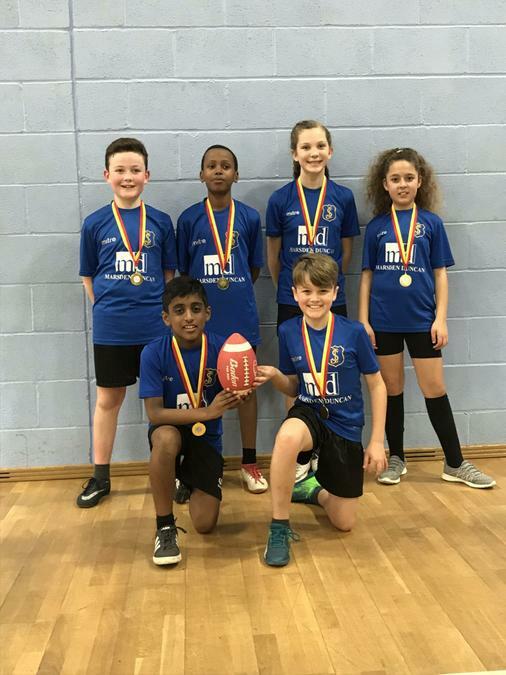 It may not have had pom pom wielding cheerleaders or a half time performance by Beyonce, but the Thanet Primary Schools’ American Flag Football Tournament was a thrilling affair nevertheless with St Joseph’s crowned the Thanet Primary Schools Champions. A winning 4 match run with a decisive final against Chilton Primary School saw the St Joseph’s team use teamwork and masterful strategy to beat the opposition to invade territory and steal the flag. Unlike the game’s cousin over the pond, American Flag football is a no tackling game of invasion and flag tagging in which inventiveness and dexterity are key skills. Stella Maris was incredibly proud of Sophia, Phebe, Alex, Damien, William and Daniel who rose to the occasion with a stellar performance of a sport that they had not previously played or practised within the school sporting curriculum!